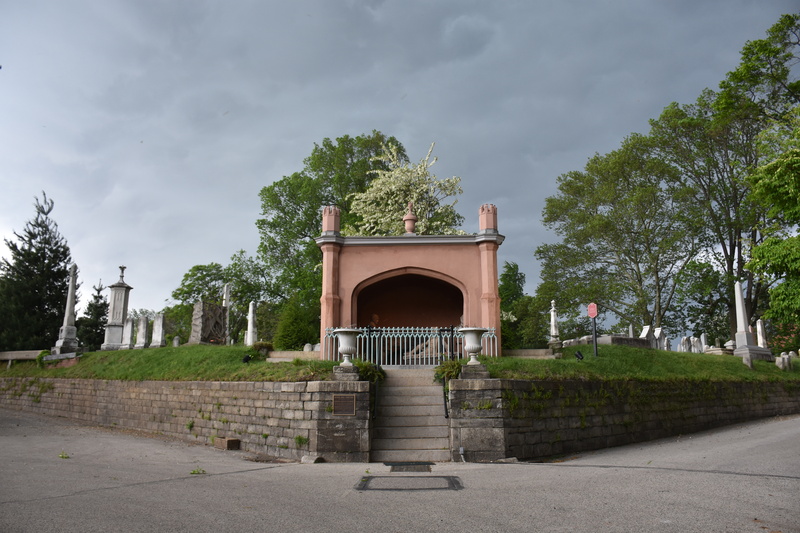 When listing off romantic destinations, you may not immediately think of a historic cemetery, but we here at Laurel Hill happen to know that some of the juiciest, most scandalous, sweetest, and most enduring love stories in American history came to an end right here in the earth overlooking the Schuylkill River. Margaret (Maggie) Fox and Elisha Kent Kane were probably destined to cross paths at some point in their lives. Given their respective professions, it seems inevitable. Maggie was touring the country with her sisters as they demonstrated their supernatural ability to communicate with departed spirits. Their method was known as a séance, and restless souls could speak to the living by making rapping sounds which were then interpreted by the Fox sisters for a spellbound audience. Little did the young girls know that their ghostly hobby would birth an entirely new religious movement which set down firm roots in pre-Civil War America. Elisha was a naval doctor and war veteran turned Arctic explorer. After serving his country valiantly in Caleb Cushing’s China Commercial Treaty mission, in the Africa Squadron, and in the US Marine Corps during the Mexican–American War, he was appointed as chief medical officer on the Grinnell Arctic expedition searching for the lost Sir John Franklin and his crew. In 1853 Kane then organized and led a second expedition continuing to push through the polar ice in an expanded search. In other words, both of these young people existed entirely between two worlds – known and unknown; well mapped and unexplored; real and imagined. They first met right here in Philadelphia. Maggie traveled to the city with her mother and set up shop in Webb’s Union Hotel (in the appropriately romantic bridal suite). She was here to conduct a series of séances for paying audiences, and it just so happened that a brave, dashing, handsome Arctic explorer was watching her one November morning. He, like many other Americans, was quite skeptical about Maggie’s abilities to communicate with those who have passed on. While we can never be 100% sure why he showed up that day, we do know that he was both a man of great curiosity, and a man in mourning. He had recently lost his brother Willie. Perhaps it was some combination of sadness, hope, and doubt which brought him into Maggie’s life. Right away, the attraction was apparent between the mysterious young woman with otherworldly abilities, and the intrepid adventurer. Unfortunately, potential problems in the romance also showed themselves early on. To understand why Elisha and Maggie’s love may have been doomed before it even began, we need to understand a bit about Victorian cultural expectations, particularly as they pertain to romance, class, and community standing. You see, Maggie (and her younger sister Kate – famously known as the Fox Sisters) began exhibiting the skills of a world-class spiritual medium when she was only 13 years old. It took almost no time at all for her to build a loyal following of paying customers. Her oldest sister, Leah, noticed the potential in this and chose to take the girls on the road. The Fox sisters performed séances for the likes of PT Barnum, George Ripley, Harriet Beecher Stowe, and James Fenimore Cooper among many others. Horace Greeley, editor of the New York daily Tribune, was so impressed with what he believed to be the authentic clairvoyance of the young women, that he offered to personally pay for their education. He knew that many spiritual mediums of the day were little more than hucksters, and his hope was to increase the intelligence and worldliness of Maggie and Kate to further bolster their credibility. Leah, not thrilled at the idea of having her main source of income secreted away at school for years on end, agreed only that Kate should be educated. She believed it was best that Maggie (by far the higher earner) keep working. To put it another way: when the worldly, sophisticated, genteel, and upper-class Elisha Kent Kane first met Maggie Fox, she knew almost nothing about polite society, or the world around her. Kane immediately saw this as a problem. Even as he was bewitched by the extraordinary young woman, he was embarrassed beyond words when she unwittingly made blunders such as leading him through a room with a bed in it – without the decency of having a chaperone present – or placing her hand on the back of his chair as they sat next to one another. Oh, and there was also the slight problem of Kane being convinced that spiritualism and séances were a form of snake oil being sold to particularly vulnerable, grief-stricken people. One could spend months attempting to untangle the complicated, seemingly on-again, off-again relationship of Elisha and Maggie. Indeed, many authors and historians have done exactly that. Even their own letters seem to indicate a cycle of confirming their engagement, then later saying goodbye to one another forever, only to write back shortly thereafter talking about getting married again. In fact, there may even be some evidence that Elisha and Maggie were married, albeit informally and largely thanks to a bit of a loophole in Pennsylvania Quaker law. There is also the matter of the will which Elisha wrote up ahead of a voyage to London where he specified that $5000 be left to his lawyer brother, potentially with the understanding that it be given to Maggie upon his death. Perhaps it is this muddy timeline which contributes most to the sad events which happened shortly thereafter. On his trip to London, Elisha became sick. Rather than returning home, his doctor recommended that he sail to Havana, Cuba where the warmer climate would hopefully help him recover. He never did. He died on February 16, 1857 at only 37 years old. With Elisha’s death, the fight between Maggie Fox and the rest of the Kane family was just beginning. Maggie, still deep in mourning 18 months after Elisha’s death, converted to Roman Catholicism to honor the man she believed to be her late husband. Doing this naturally alienated her from the spiritualist community (remember, spiritualism was considered a religion. Converting to a different religion sent a very clear message). With no way to make a living holding séances anymore, she wrote to the Kane family asking for the $5000 inheritance. The family refused, asking to see all of Elisha’s correspondence to Maggie so they could determine whether or not an engagement or even a marriage ever took place. Maggie, now going by the name Maggie Kane, refused, and instead decided to sue the Kane family. She seemed to understand the inherent value of the letters she held and was probably afraid that the Kane family would at best refuse to return them, and at worst destroy them as damning evidence. What we do know is that the Kane family sadly never paid Maggie a single penny. At one point, they had agreed to pay off her debts and forward her $2,000, but then went back on their word knowing that Maggie did not have the money to sue them a second time. The only recourse Maggie seemed to have was that stack of correspondence between herself and Elisha. She took all of his letters, with all their private declarations of love and devotion, to a publisher and turned them into a book titled The Love-Life of Dr. Kane, which is as joyfully scandalous as it sounds. Unfortunately for Maggie, her story only gets sadder from here. She struggled with depression and alcoholism for the rest of her life. At one point, she made headlines by coming forward and debunking the séances she used to perform with her sister. She admitted that the rapping sounds heard by the audience were nothing more than a shared ability for the sisters to very loudly yet imperceptibly crack their toes. Shortly after this, she recanted her confession, and tried doing séances again with limited success. Maggie died in 1893 at the age of 59, destitute and alone. Whether or not she ever contacted her husband on the other side is a mystery we may never solve. Not every love story has a happy ending. Shakespeare knew it, Victor Hugo knew it, and Victorians living every day lives knew it. You’ll have your own chance to hear stories (some happier than Maggie and Elisha) this Saturday, February 9th at Laurel Hill’s ‘Till Death Do Us Part tour, which will include a stop at Elisha Kent Kane’s family vault, itself a historical landmark. Oh, and Maggie’s book? It’s still in print. You can grab a copy and decide for yourself whether or not these star-crossed lovers were ever married. We think they were. Interested in more stories like this? Be sure to check out Laurel Hill’s EVENTS page for a full calendar of our themed walking tours! Laurel Hill Cemetery, Beautiful Place I Lived in the neighborhood! I’ve missed this blog. They’re so interesting! They used to arrive in my email on a regular basis and I would share them with friends who enjoyed them as well. What’s up? This is the first one I’ve received in quite some time. I enjoyed the post – true love will never fade!